(INCHEON=Yonhap News) Five organizations including Incheon Metropolitan City, Incheon Airport, and etc. have agreed to build a Maintenance, Repair, and Overhaul(MRO) industrial complex at Incheon Int'l Airport. 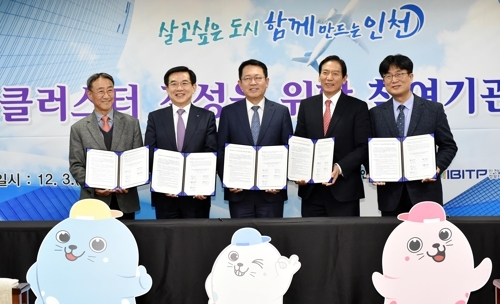 The five organizations agreed to strengthen partnership for the development of Korean aerospace industry and the aerospace cluster, including the MRO complex. They will create a 'Joint Task Force for the Development of MRO Industry' this year to cultivate personnel, establish a Training and Education Center, build a MRO complex, and attract global MRO companies. Incheon Airport is an international hub with 200,000 passengers taking 1,000 airplanes per day. Yet, the entire demand for MRO works at the airport is carried out by only two airlines' self-conducted MRO capability and consignment-based MRO works done by foreign companies. As such, up to 4 trillion KRW is used to pay the consignment cost by foreign companies, and equipment malfunction accounts for more than 20% of all cancelled flights at the airport. After the fourth phase of development followed by the opening of Terminal 2, Incheon Airport becomes a giant with an annual passenger of one hundred million. Thus, it needs to benchmark major hub airports' MRO service to meet the demands in the near future, according to the city of Incheon. The city expects that after its completion, the MRO industrial cluster will bring a huge economic benefit, which includes direct and indirect employment of 19,600 people, production increase worth 5 trillion KRW, import-substituting effect worth 1.68 trillion KRW, and reduced opportunity cost worth 4.4 billion KRW.